If you’ve been doing research on how to cut cable and have read any cord cutting guides so far, you’ve probably seen dozens of different streaming options. Streaming services like Sling TV, satellite subscriptions like DISH, and plenty of free “illegal” sites like Stream Daddy that all offer different cord cutting options. Rabbit TV is another option you might have heard of, but falls closer in line with the likes of Stream Daddy than a real cord cutting service. Rabbit TV is a little bit different than Netflix or DirecTV Now because it doesn’t actually offer its own content. Rather, Rabbit TV charges a monthly fee of $2 to act as a content aggregator for movies and TV from other online sources. If you want to know how to watch Big Bang Theory online, you can type it into Rabbit TV’s interface and it’ll show you that the show is available through CBS or various rental sites. If any of the sites that your results point to requires a subscription, you have to either sign up or enter your log in credentials. You have to pay for the external services the same way you would if you didn’t find it through Rabbit TV. You’re not paying for the content, you’re paying for the convenience. Everything that Rabbit TV offers is already available online and anyone with access to a search engine like Google or Bing can save their money, at the cost of their time. Is Rabbit TV a scam? Verdict: Don’t buy the USB device. Verdict: Save your money and use Justwatch.com instead. 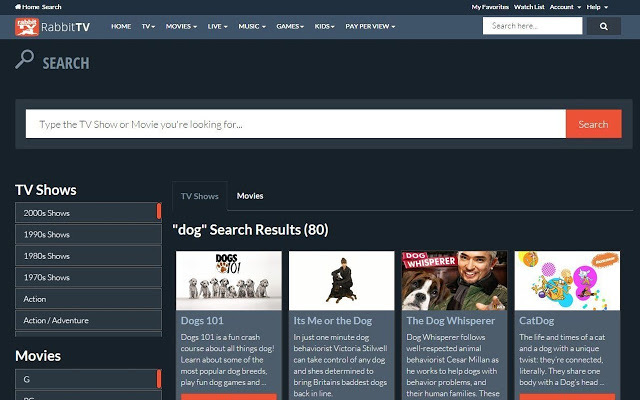 Rabbit TV maintains a database of thousands and thousands of shows, movies, and series. It takes a lot of time and manpower to create such a comprehensive list and even more to regularly maintain it. If they only updated the list once a year they’d save a lot of money, but they’d likely find that 80% of their links stop working after a short time. Our database only covers a few thousand channels across certain services and it takes a lot to maintain. If it can save people time, there’s an argument to be made for their $2 monthly fee. Before we get into a review of their subscription service, we wanted to discuss their USB device first. Their USB device alone is a good reason to lose a lot of trust in the company and starts to lean the meter toward “Scam”. 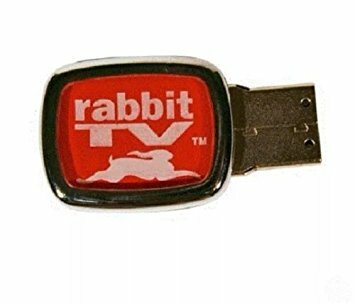 For under $10, you can purchase a Rabbit TV USB Stick on Amazon. You can usually find them in the “As seen on TV” bins at bargain stores too. The Rabbit TV USB gives you a year of access to their subscription service for a discount of about 50% off. However, to use your discounted service you’re forced to run it through the USB rather than just a browser. While it does give you access to the entire Rabbit TV channel list, the USB itself is completely unnecessary. 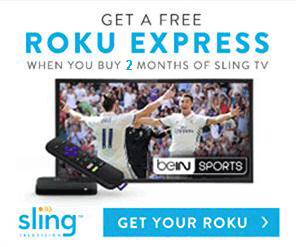 It’s there as a marketing tactic and to convince users that it’s similar to a TV tuner. It’s a lot harder to market a subscription service to non-technical people than it is to sell them a flash drive that “contains thousands of TV shows and movies”. If you want to offer a discounted rate for the first year of subscription, do just that. There’s no reason to hide the deal behind a USB and trick people into thinking it’s the USB providing any value. All it does is force the users to waste a USB port while using the service and ruin the convenience of not having a physical component. Although it didn’t happen to us (we take our security seriously), a lot of people have complained about false charges and spam happening as a result of the USB. There has also been a large number of complaints of viruses. The malicious pop ups, consistent email spam, and marketing strategy all make the USB seem like a way to prey on older and less tech-savvy people. There are plenty of people who don’t know better and Rabbit TV knows that. It’s a despicable practice and sheds a lot of light on the Rabbit TV company. Although we feel strongly about the Rabbit TV USB, the following review of the subscription service was done separately to make it fair. Rabbit TV is a subscription service for convenience. The interface and mobile apps make the service quite smooth and it’s a great alternative to digging through search results. Even if you’re not a subscriber you can use Rabbit TV Go to view some of their database. It’s well designed, completely intuitive, and quite in depth. The free version online doesn’t include nearly as much of the content as their paid subscription, but at least it helps to show what the service does. Although there isn’t a Rabbit TV Plus free trial, Rabbit TV Go is a good alternative. Browsing around, you can see how expansive their database is. 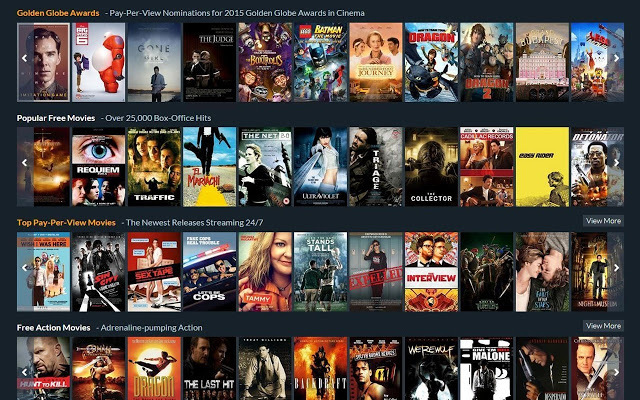 Everything is broken down by categories to make it easier to find something to watch if you’re just browsing. You can even search by free content only or add pay-per-view movies and rental TV shows if you don’t mind purchasing something. If you already know what you want to watch, the search function performs well and is actually quite fast and responsive. 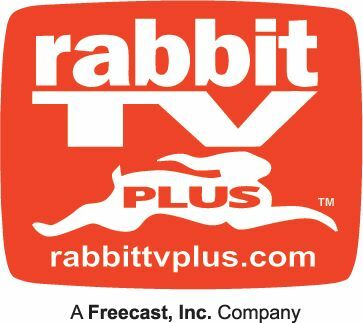 Even though Rabbit TV Plus is a great resource and better than a Google search to find TV shows, it’s hard to recommend Rabbit TV Plus as a paid subscription. It only costs $2 a month, but as a site that aims to save as much money as possible on TV, we’d suggest using free alternatives. We’ve explained Justwatch.com in our online TV guide article, and feel that it offers an incredibly similar experience as Rabbit TV Plus without the subscription cost. If you’re not a fan of Justwatch, there are plenty of other services like it that offer a similar database for free. These sites are built off of theTVDB.com, that offers free access to it’s database. We did some digging trying to find out if Rabbit TV uses the TVDB, but couldn’t find anything about it. It wouldn’t come as a complete surprise if they did, but would further prove the point that the free options are just as good or better. A few years ago, before these free sites that run off of the TVDB existed, Rabbit TV might have earned a recommendation by us if you were looking to cut the cord. But when there are free alternatives that offer a better interface and equally comprehensive database, it’s hard to recommend the paid option. Let’s compare Rabbit TV Go’s results for Two Broke Girls with Justwatch’s. If we were to show you both of these images and ask you to tell us which one was from a free service, which one would you choose? While not completely indicative of the services, it helps to paint a picture of what to expect. Rabbit TV Plus might be better at finding single free on-demand episodes of discontinued shows, but overall we’d much rather pay a monthly fee for a subscription to Justwatch than Rabbit TV Plus if we were forced to make the choice.